International #IPADay is an event geared towards making craft beer more accessible to the masses. 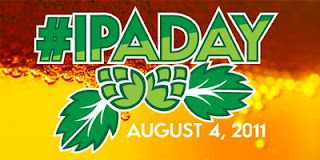 Please encourage all of your non-beer drinking friends to take a break from their normal beverage routines to join the worldwide craft beer celebration on August 4th! This is a time for education and advocacy! We should all set out with the goal of converting at least one person, if not the whole world of drinkers, into craft beer lovers! So wherever you on Thursday, take the time to enjoy an IPA and introduce the style (or craft beer in general) to someone who wouldn't normally drink it. I'll be down at the most appropriate place there is for International #IPADay, the Petrol Station, recently crowned as the "Most Bitter Bar in America" by Stone Brewing. They'll have a plethora of IPA's on draft and will be tapping three casks at 7:00pm. Rumour has it, a couple of those casks will be from the elusive Brewluminati series (including the latest release) brewed by Independence Brewing. Those don't make it down to Houston very often, so its an event not to be missed. Just something whispered between members of the Brewluminati that I managed to overhear.